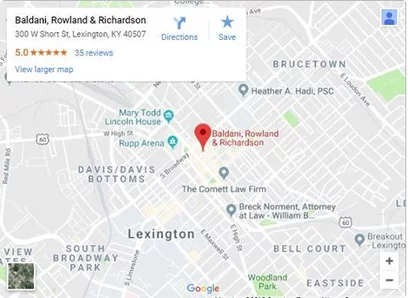 Established in 1988, Baldani Law Group has successfully represented thousands of individuals across the Commonwealth of Kentucky. With over 100 years of experience, let our team of trial attorneys fight for your rights. Don’t hesitate to ask. Talk to an experienced attorney who will make sure you know your rights. To get the most out of your consultation, we recommend bringing all documents pertaining to your case including criminal citation, bond documentation, accident report, etc. Although a fee applies to family law consultations, that fee will be applied toward the legal fees for the matter we are retained to handle. Client satisfaction is our number one priority. We understand emergencies don’t always happen between 8:30 a.m. – 5:00 p.m. Monday through Friday. Our attorneys strive to be as accessible as possible, giving our clients our personal cell phone numbers. Whether it’s reviewing criminal discovery, discussing family law issues, or evaluating a personal injury settlement proposal, our attorneys will devote as much time as necessary to make sure our clients completely understand the issues and make informed decisions. Large Firm Resources. Small Firm Attention. Our clients are considered family at Baldani Law Group. We make your problems, our problems. With five attorneys and three support staff all working toward the same goal, we are able to give clients unmatched service and most importantly deliver results. At Baldani Law Group, we use a “team approach.” The reason for this is simple. Our team approach allows us to aggressively tackle our client’s problems by utilizing over 100 years of experience and combined knowledge to find the right solution. Our attorneys come from diverse backgrounds that include: a former prosecutor, former public defender, and former judicial staff attorney. Instead of just hiring a solo-practitioner, our clients choose a trusted legal team to fight for their rights. Whatever criminal charge, family issue, or personal injury case you have, you can rely on the trial-tested lawyers of the Baldani Law Group. Our attorneys have extensive experience when it comes to trials. Appearing in court on a daily basis, our attorneys know our way around a courtroom in any situation. Trials are won in the days, weeks, and months leading up to your one and only day in court. Our lawyers work as if every case is going to trial, which means that we are always prepared. We understand unexpected legal expenses can be a burden on families. We can’t promise that we can make accommodations to represent everyone, but we will try our best to work with each individual prospective client to provide the representation they deserve. For personal injury cases, no initial retainer is necessary and we only get paid if we are able to successfully settle the claim or obtain a verdict. I’ve worked with Abe. He’s an amazing man. Always keeps his word. Gets the job done in a fast timely manner. He’s the truth. All the time. Too bad you can only give five stars!! Frankly, I’ve had to use the services of Tucker and Brandi more often than I want, but what a super job they did. They are professional, but they don’t lose that personal connection. I would HIGHLY recommend them to anyone, anytime. Love you guys!!!! Abe is the best lawyer ever. Fast worker, caring and gets the job done right. ???? Abe is the best lawyer available. It was really a pleasure working with him. I would definitely recommend my friends or any other family member to consult Abe. Brandi Lewis is amazing!!! Great communication, clear expectations, efficient and effective. We honestly could not ask for more from her!!! This entire team is a very reputable office that should be used with any legal needs. Thanks for everything!!! Some of our cases garner extensive national media attention. Our criminal defense team’s expertise goes beyond the courtroom and into the court of public opinion. From a minor traffic ticket to a high profile felony case, you deserve the best representation. Here are just a few media outlets that have featured our attorneys or cases.